In September 2016, as cash was becoming an increasingly important and common mean for aid delivery, REACH and the Iraq Cash Working Group (CWG) began developing the Joint Price Monitoring Initiative (JPMI), with the aim to harmonise price data collection in Iraq and enhance collaboration between cash actors. Over a year later, the JPMI is undergoing its 12th round of monthly data collection. Recording prices of food and non-food items (NFIs) on a regular basis, the JPMI enables the monitoring of prices and availability of the most commonly sold and used commodities, to help inform cash-based humanitarian action. Since the first round, prices have remained largely consistent, with an average monthly price change of -0.2%. Indeed, overall prices have fallen by a marginal amount in all but three assessed months. 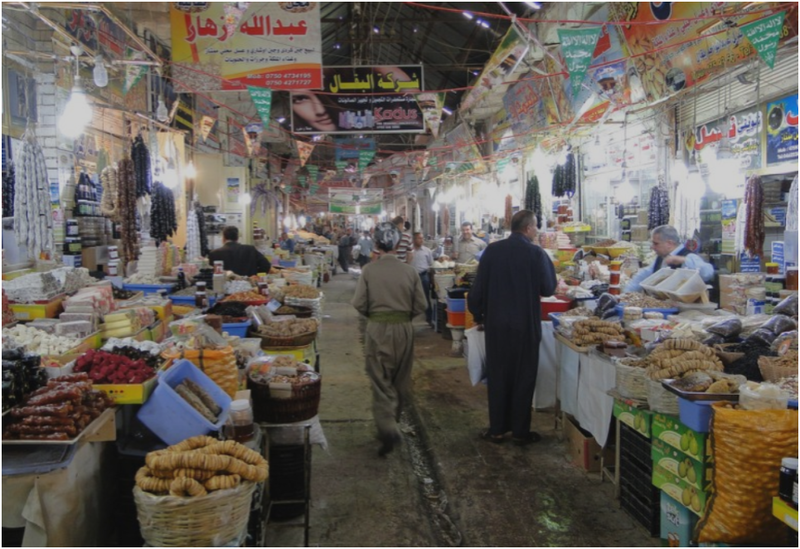 For food prices, the two assessed districts of Baghdad – Karkh and Abu Ghraib – were the most expensive, recording among the top three highest average prices in every round. Following Baghdad, Erbil was another expensive district that consistently had among the highest food prices. In terms of the least expensive prices for food, coverage has altered over time, but districts that consistently had the cheapest prices were identified in assessed areas of Ninewa governorate – Shikhan, Akre, Mosul and Hamdaniya – as well as Sumel district to the north in Dohuk governorate. For NFIs, the findings are much less consistent. Districts that were frequently the most expensive were Erbil, Karkh, Abu Ghraib, Sulaymaniyah and Zakho. Districts that frequently had the cheapest NFI prices were Sumel, Khanaqin, Mosul and Falluja. But this has changed over time. This inconsistency reflects a much larger variation in the price of NFIs compared to food goods. NFI monthly price fluctuations have been greater than food in all but one assessed month and variation among the prices for individual items is consistently high. These findings illustrate that as time has passed, the JPMI is moving beyond a monthly snapshot of prices across assessed areas of Iraq and towards providing price trends over the longer term. For the future, the JPMI will continue to support humanitarian action – as the situation in Iraq moves from emergency response to stabilisation and recovery – by collecting regular, accessible and comparable data. Access the latest finding from the September round of the Joint Price Monitoring Initiative using the following link.